Modern garage vacuum cleaners shouldn’t be the bulky, space-hogging, and heavy contraptions that were once popular in the past. The GarageVac GH120-E is a fine example of what a 21st century garage vacuum cleaner should be. It comes with a range of functional features such as a unique space saving design, easy installation, and a HEPA filtration system perfect for a cleaner environment. With a weight of just 9 pounds, the GarageVac GH120-E vacuum cleaner hangs easily on your garage wall and is flexible enough to be used in diverse locations including your RV, cottage, boat, and even a Hobby Shop. Let’s look at some of its key features and functions. Compact, lightweight, and garage space-saving design. It only takes 2 ½ feet of your garage wall space. Hypo-Allergenic Filtration system with vacuum chambers designed to prevent the vacuum’s bag collapsing and losing suction. This ensures that you always have clean air in your garage when using the GarageVac GH120-E.
Portable design for use in different places such as your boat, RV, utility room etc. One thing you’ll like about the GarageVac GH120-E is its sleek compact design, which is just right for small spaces. The GarageVac GH120-E delivers as much power as other bulkier wall mounted garage vacuums with 12 max amps but it just needs 2 ½ feet of your wall space. It fits perfectly in small one-car garages, RVs, utility rooms, boats, and just about anywhere you’d want to hang it. The GarageVac GH120-E is only 4 inches deep and comes with a handy Tool Caddy. If you compared its compact design with that of other bulkier models that take up as much as 6 feet of your valuable wall space, then you’ll see why this compact vacuum scores high in terms of size and convenience. The GarageVac GH120 weighs just 9 pounds and 18 pounds with all the accessories included. It has a sleek lightweight design and comes in red, grey, black, and white. You have a good range of styles to suit your décor. The all-steel one-piece vacuum wand is also resistant to rust and cracks. It has good suction, is fully adjustable, and delivers the same performance as the other two piece wand vacuums. The entire unit is made of strong durable high tech polycarbonate plastic. It is made in the USA and comes with a 6-year warranty from the manufacturer. 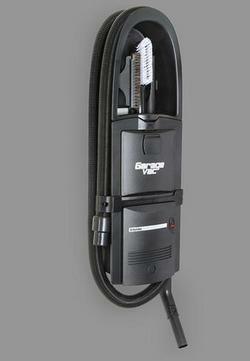 The sleek GarageVac GH120 is one of the easiest to install wall mounted garage vacuums available on the market today. It is a lightweight compact unit that can conveniently fit a garage of any size. It only takes up 2 ½ feet of your precious wall space. The vacuum is extremely portable which makes it ideal for diverse settings such as RVs, boats, utility rooms, or wherever you want to use it. With the GarageVac GH120, you won’t have to sacrifice a huge amount of your valuable wall space for some ugly looking gray tub. It is compact, easy to install, and takes care of all the things littering your garage floor, from leaves, sawdust, metal shavings, and much more. In terms of performance, you’ll also appreciate the GarageVac GH120’s patented hypo-allergenic filtration system. The innovative filtration design of the vacuum chamber ensures that the bag doesn’t collapse and fills up completely without losing suction and contaminating the air. It is a HEPA filtration system designed to maintain a cleaner environment. The hypo-allergenic filtration technology is unique to the GarageVac. GH120 is a smart choice for users who want to breathe germ-free air in their garages. The GarageVac GH120 has a long 40-foot stretch hose which shrinks down to just 8 foot for easy storage around the unit. Unlike other models that have plastic wands, the GarageVac GH120 comes with a one-piece aluminum telescoping wand that you can easily adjust to fit different lengths. The long hose can work on both small and large spaces. The stretch maintains strong suction at all lengths. The GarageVac GH120 comes with all the accessories you need for great performance. Its built-in tool caddy conveniently holds the dashboard brush, which you can use to clean the dashboard in a single swipe. Besides the adjustable wand, you also get a special brush to clean your car, a tool for cleaning upholstery, and wall clamp to hold the wand. The unit has everything you need to keep your garage neat and organized. Lightweight and portable – can be used in different places such as your boat, RV, and utility room. The only downside is its one-gallon capacity, which means you’ll need to replace the bag more often than in a larger machine. In online reviews, most users of the GarageVac GH120 have expressed great satisfaction with its compact design, long stretch hose, and the lightweight easy portability design of the garage vacuum. It has a quiet operation and is extremely easy to install. Anyone can install it simply by hanging it on the wall without the need for special tools. It is a USA-manufactured product that comes with a 6-year warranty from the manufacturer. If you are looking for the best way to keep your garage neat and organized, the GarageVac GH120-E is your best option.